Michelle Halford creates her own kind of minimalism. 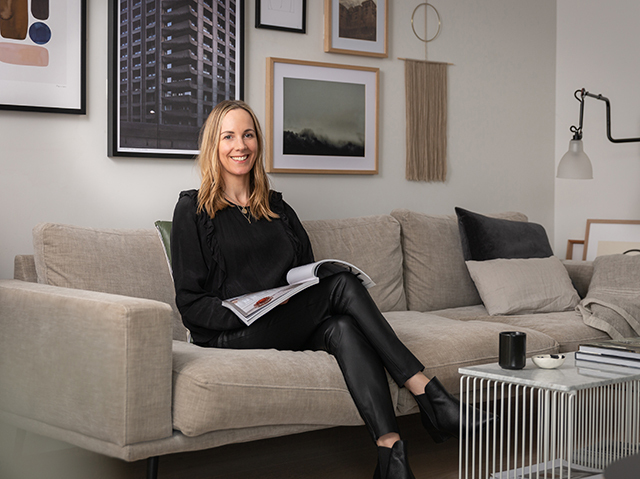 She injects her signature serene yet masterfully executed look into beautiful homes and has quickly become one of the most sought after interior stylists in New Zealand. We delve into her journey to talk about work, motherhood, her wellness rituals and what she's learnt along the way. I worked for a magazine publisher and became obsessed with the interior titles. This was further fuelled when my husband and I bought our first home. When I left to start a family the digital age was beginning to take off and I started reading interior blogs and became addicted to using Pinterest. Honing in on my love of Scandinavian design, I was taken by surprise when my following grew very quickly and at that point I knew I wanted to share what I loved on a bigger platform. Starting a blog felt like a really natural progression and when our youngest was around the toddler age I fired up a blogger website. I worked some crazy hours around taking care of the kids to get it off the ground but I loved every minute. When I found that people were reading and being inspired by the content I was curating it felt really rewarding and it motivated me to carry on. When we decided to embark on a home build this provided a whole new angle for the blog, where I could share my own journey, creating mood boards and planning the interior design of our home. Just before we moved in I hopped on the Instagram bandwagon, sharing my own photography of the interior coming together and that's when things really started to take off. Styling has become my favourite part of the job and I was excited when brands started to reach out, wanting me to style their products in my home. Having advertisers on board within the first year of blogging and other opportunities that started to follow such as working with brands to create web content, sponsored posts and styling work. Warm minimalism. I take a pared back approach to styling and love clean lines and elegance but texture is always a key element in creating a warm, lived in feel. Surrounding yourself with furniture, art, and objects that you love. For me, books and natural elements make my space feel homely. Right now I'm loving dried flowers and hand crafted pieces that tell a story. Also things that provide comfort and enhance daily rituals like a cosy throw on the sofa when reading, climbing into bed with natural linen sheets, and drinking out of a favourite coffee cup. As a working mum I'm not sure I ever achieve a true state of balance, but I try to exercise regularly, spend time outdoors and I read every single night, even if I can only manage one page before nodding off. Live a life that makes you happy. For me that's loving what I do, loving who I'm with and relishing simple, every day moments. I love being surrounded by beautiful things and I feel so much lighter when the house is uncluttered and tidy. But if it's a mess and the kids are happy, then I know I'm doing okay. Never compare yourself to others, laugh often and always be grateful. I eat well, spend time outdoors, walk regularly and try to bring out the yoga mat at least twice a week. Putting down the phone and spending quality time with my friends and family is really important for my personal wellbeing. Being an introvert I gravitate towards alone time but I know that I need to regularly 'top up my tank' and take the time to nurture close relationships or I can start to feel a bit low. I also take really good care of my skin and never leave the house without wearing sunscreen, rain or shine. I love using natural products with active ingredients - face masks are always a part of my weekly routine. I also love reading books, not only as an escape, but also to learn. I never want to stop learning. Motherhood has changed my world in so many ways. The journey is both exhilarating and terrifying. My boys have taught me so much and I love seeing them them grow into their own little people. Of course it's immensely hard at times, your emotional landscape changes dramatically and every pain they feel, you feel. But essentially it's like we've created our own little team and I now couldn't imagine living life any other way. Being outside in wide open spaces recharges and inspires me and when I'm close to the sea, even better. Any chance I get I'll escape to one of our beautiful beaches - either north of Auckland for the pristine white sand or the West coast beaches for the black sand and ruggedness. Sunday is the one morning I get a little sleep in, but hunger and a small child jumping on me gets me up early enough to make the most of the day. Breakfast will be my favourite - an omelette, avocado on toast and a piccolo. We'll then head to the beach, meet up with friends and go for a hike followed by a swim and lunch. A quiet afternoon spent reading, a home cooked dinner with a glass of red, followed by a little Netflix after the kids go to bed. One of my favourite quotes is “Make your vision so clear that your fear becomes irrelevant”. Listen to your gut, don't be afraid to say no, love big, appreciate the small things and make the most of every single day.